Muslim Americans are widely seen as victims of discrimination, but also viewed by a slim majority as members of a religion that encourages violence, according to an Economist/YouGov poll released Friday. Americans who know a Muslim, meanwhile, are more likely to view adherents of the religion favorably. Those results come in the midst of a spate of either suspected or confirmed anti-Muslim hate crimes. The shooting of three Muslims in Chapel Hill on Feb. 10 by a killer with murky motives crystallized the moment of fear. A full 73 percent of Americans believe Muslims face a great deal or a fair amount of discrimination. That total outstrips both African-Americans, whom 63 percent of Americans see as victims of bias, and Mexican-Americans, who are viewed as targets of discrimination by 60 percent. The general feeling that discrimination exists is further underlined by questions about the motives of alleged Chapel Hill shooter Craig Stephen Hicks. Police initially said the killings appeared to have stemmed from a parking dispute, but also added that they were looking into whether religion was a factor. Authorities have not charged Hicks with a hate crime. However, 45 percent of Americans said Hicks should be charged with a hate crime, compared with 18 percent who believe he should not. Those supportive-sounding numbers are offset by Americans’ other views on Muslims. Many Americans seem to have adopted the views of Bill Maher and Mike Huckabee. A majority — 52 percent — of Americans said Islam is more likely than other religions to encourage violence. Suspicion of Islam was much higher among Republicans (74 percent) than Democrats (41 percent). “There’s just a lack of access to Muslims, and because of this lack of real-world contact, a number of conservative media sources have biased opinions,” said Robert McCaw, government affairs manager for the Council on American-Islamic Relations. Knowing a Muslim does seem to alter a person’s impression of members of the religion. A majority (53 percent) of Americans who personally know a Muslim disagree with the idea that the religion is more likely to encourage violence. 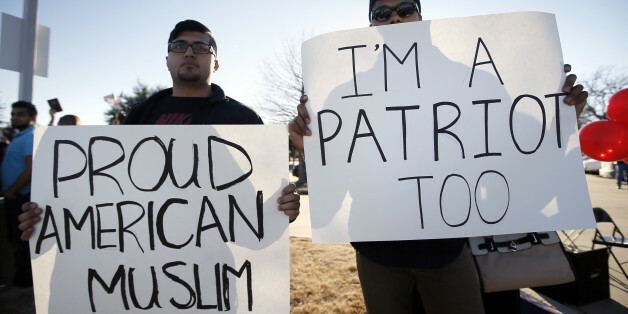 Americans who know Muslims are also significantly more likely to view them as patriotic. The Economist/YouGov online poll surveyed 1,000 respondents from Feb. 14 to 16 with a margin of error of 4.4 percent. Do you have information you want to share with the Huffington Post? Here’s how. This entry was posted on Sunday, February 19th, 2017, 9:57 am and is filed under Bigotry, Donald Trump Islamophobe, Hate, Hate Speech, Islam-A Deen or Road-map of Life in Modern World, ISLAM=PEACE & BROTHERHOOD AMONG MANKIND, ISLAMOPHOBES, Islamophobia in America, Racism, State Sponsored Islamophobic Hate Speech. You can follow any responses to this entry through RSS 2.0. Both comments and pings are currently closed.